The Cary-Lift 254i features an overhead lift arm design, giving the operator full front visibility when lifting or transporting loads — a sharp contrast to the lift arms on wheel loaders, which are located directly in front of the vehicle. Pettibone has introduced the Cary-Lift 254i to its line of pipe, pole and log handlers. 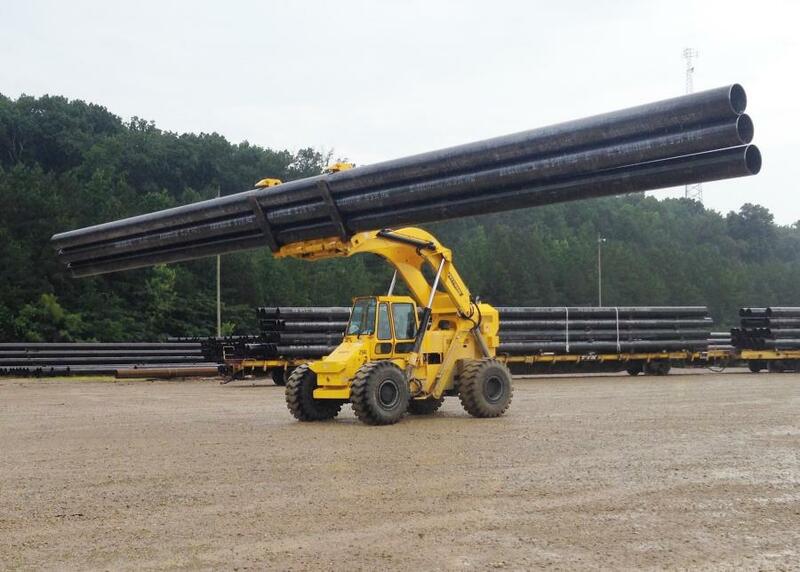 Purpose-built to deliver numerous safety and performance benefits over other material handling alternatives, the Cary-Lift is particularly adept at moving and placing heavy pipe in stock yards and construction sites, according to the manufacturer. The Cary-Lift 254i features an overhead lift arm design, giving the operator full front visibility when lifting or transporting loads — a sharp contrast to the lift arms on wheel loaders, which are located directly in front of the vehicle. Additionally, Cary-Lift forks are capable of tilting down 90 degrees for specialized lifting tasks, such as unloading pipe from railroad gondola cars. The 254i is powered by a 225-hp Cummins QSB6.7 Tier IV diesel engine with DOC and SCR aftertreatment. The unit includes an engine-driven fan, cooling package and engine block heater as standard equipment. The machine provides a maximum load capacity of 25,000 lbs. (11,340 kg) and max lift height of 14 ft. (4.2 m). Offering 4-wheel drive with 2-wheel, 4-wheel and crab hydraulic power steering modes — and with the wheelbase limited to just 12 ft. (3.6 m) — the 254i can achieve a turning radius of 23 ft. 6 in. (7.1 m). Unlike forward-reaching articulated loaders, the Cary-Lift's heavy-duty, solid steel frame design allows it to take full loads into sharp turns without sacrificing load capacity or stability, according to the manufacturer. Hydraulic frame sway control and side shift capabilities further stabilize loads by leveling the lifting frame when driving on uneven ground. The sway cylinder moves 7 degrees both right and left of center. A sliding door offers quick access to the comfortable operator cab, which includes a tilt/telescopic steering column and a swiveling, adjustable suspension seat with seat belt, padded armrests and lumbar support. Dual joysticks provide intuitive controls to efficiently shift gears and control the hydraulics. Large tinted safety glass windows and a rear-view camera with 7-in. display are standard. A quick attach system increases the machine's versatility, with fork frames, pipe and pole baler, log baler, scrap baler and tire handler all available as attachments. For more information, call 800/467-3884, or visit www.gopettibone.com.